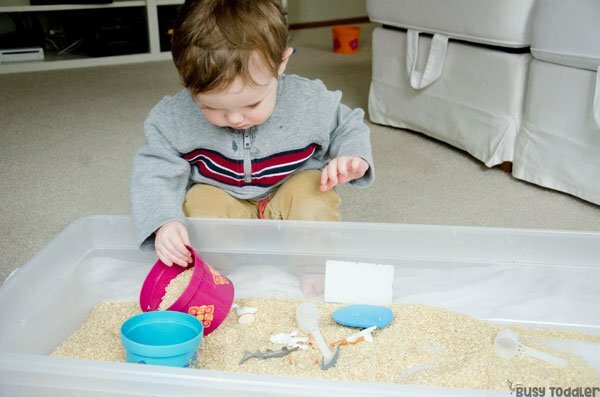 Inside: Ideas for how to make your first sensory bin for tabies and toddlers. 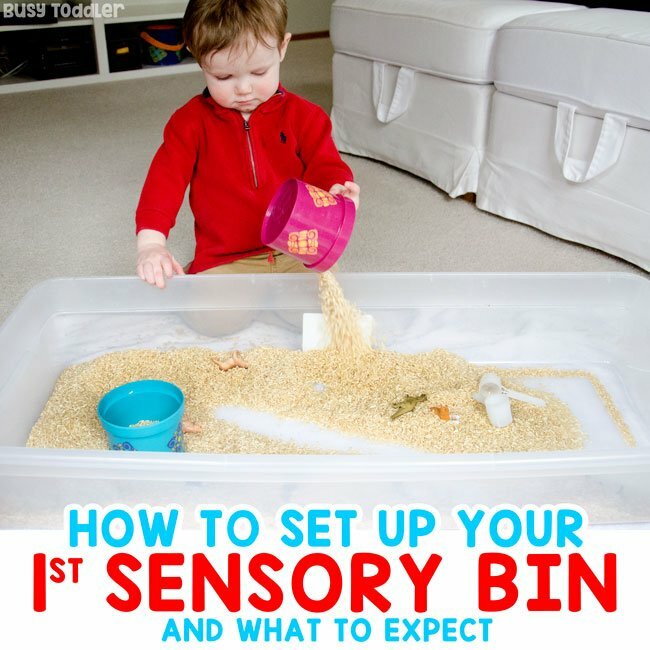 How do you set up your taby’s first sensory bin? I am all about that taby life right now. Do you have a taby? You know, that middle ground where a child isn’t a baby anymore but definitely isn’t a toddler yet? I have one. 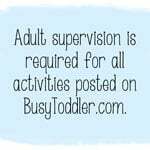 He’s 17 months old and loves sensory activities. Sensory activities are his jam and one of the few activities that will hold his taby attention. But how do you build a sensory bin for a taby? They make crazy unreasonable messes because, well, tabies. And did I mention they taste everything? What are we supposed to do with them? How do we make a sensory bin that is just right for a taby? Well, for starters, come to grips with this fact: they are going to taste it. They’re going to go for a lick, or a fistful, or a side nibble. It will happen. And that’s OK. It’s developmental, it’s part of being a taby, it’s totally normal. It’s also why you pick a taste safe sensory base. RELATED: Looking for more taby activities? 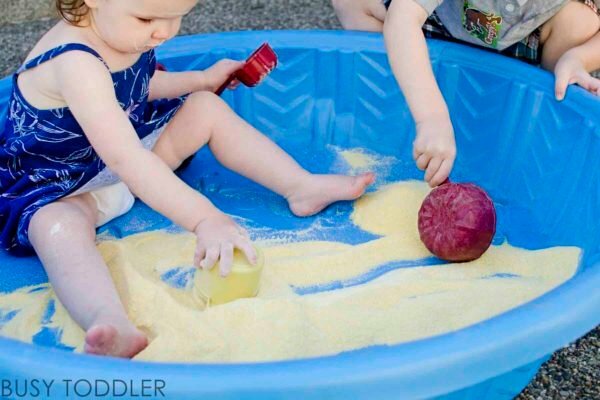 Check out this list of 30+ Taby Activities! STEP ONE: Pick a taste-safe, totally lickable sensory base. My personal favorite is uncooked rice. It’s edible, not chokable, and really really fun to work with. It pours, dumps, spreads, smooshes, and generally speaking just feels awesome to play with. 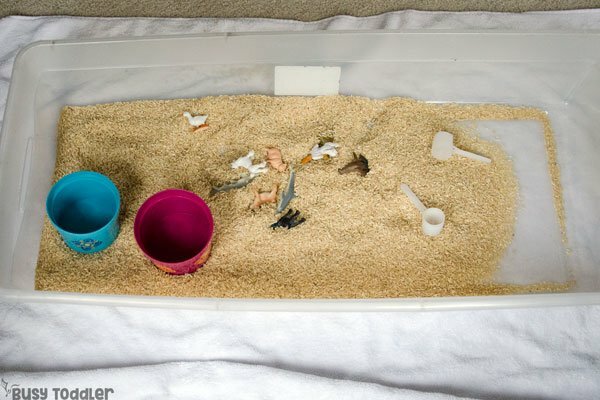 It’s perfect for a first sensory bin. Sensory bins are so great for kids – especially tabies – because it gives them this beautiful, safe environment to explore and engage with. Now that we’ve got our “safe to lick” base picked out, how do you contain the mess? A very unglamorous look at a taby sensory bin. STEP TWO: Put it in the right sized bin. A taby with five cups of rice is not meant for a shoe box sized bin. They need space. They need to breathe. They need plenty of room to slosh, push, and move that rice. They need ample space to pour. I have two bins I love: a 31 qt bin and a 41 qt bin. Both have short sides, are long, and provide plenty of room to work. A small bin is just asking for rice to be dumped out of because, well, rice needs space to be played with. STEP THREE: Find the biggest blanket you own. Remember that line from Jaws: “We’re gonna need a bigger boat?” Well, you’re gonna need a bigger blanket. Think table cloth sized if you have one of those lying around. Tabies make messes. Say it with me: My taby will make a mess. Come to terms with this. But it doesn’t have to be a raging house party type mess. Lay out your giant blanket. Set your bin in the middle. The mess should be totally contained by this blanket (or at least pretty darn close). Even though they are “just” tabies, lay out the “rules”: Keep it in the bin. Redirect their hands back into the bin. Steer their pouring over the bin. Scoop up messes and say “Uh Oh! Let’s put it back in the bin.” They will catch on. My son was 15 months when we made his first sensory bin and by 15.5 months old, he said “UH OH” when he had an errant pour. He listened and learned and already knew the boundaries. STEP FOUR: Park yourself on the floor with them. This is a taby with a bin of mess. At no point are you walking away. This isn’t an independent activity. This isn’t an “I’m just gonna grab the clothes from the dryer real quick” activity. This is a “We do together” adventure. STEP FIVE: Don’t just set down a bin. Add some flair to it. Your taby doesn’t want to just play with rice. They need a little something something to go along with it. Add in some scoops, buckets, cups, spoons – anything for them to fill. Add in some small toys to bury. Put in a muffin tin (those are always fun in a bin). Remember to help them learn how to pour into the bin, how to fix the uh-ohs, and how to play nicely with the toys in the bin. RELATED: Curious what sensory bin supplies I keep on hand? 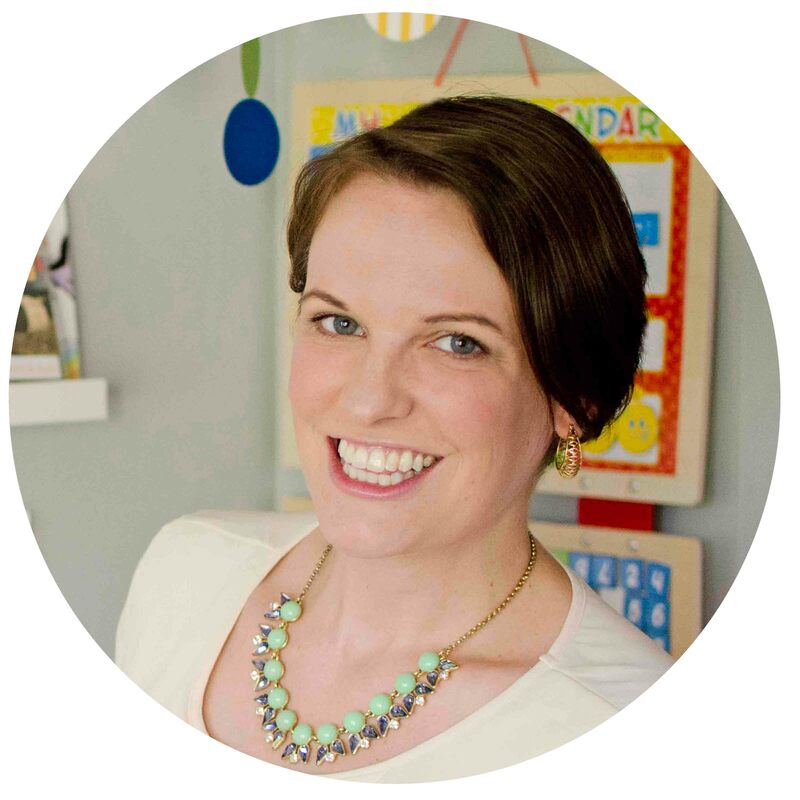 Check out my Sensory Bin Basics post. STEP SIX: Don’t give up on bins (or tabies) after the first time. 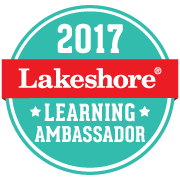 My last piece of advice: remember, they are just learning. They will make a mess the first time, but with second chances, trying again, and giving it another go – they will learn. Sensory bins are so similar to dinner time: the mess is all over the floor. You have to teach them not to throw food. You have to show them not to dump their plate. But you keep trying because they have to have dinner. You can’t give up. 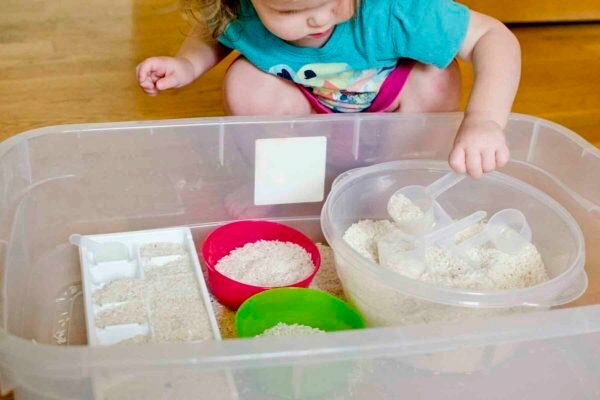 Look at sensory bins the same way: this is something that’s really good for them (and eventually will be an “independent” activity). Don’t give up. You didn’t walk away from mealtimes just because they spilled their cup all over the table. You taught them. Teach them here too. 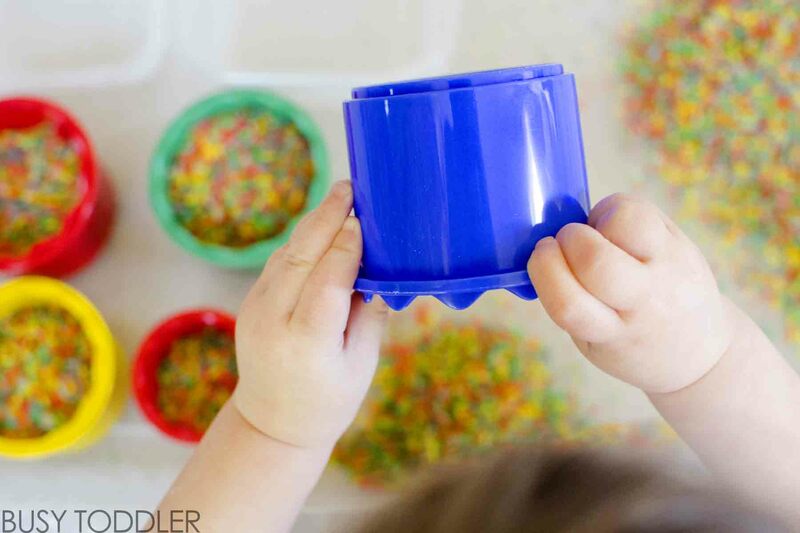 You’re ready to make your first sensory bin! Look to the future: your taby is now a toddler. And they’ve been doing sensory bins for months. You set down a bin of rice with a puzzle buried deep. Your toddler moves through the bin, barely any rice gets out, and you sit watching from the table drinking a hot cup of coffee. Your toddler is an old pro. It’s all about setting them (and you!) up for success. 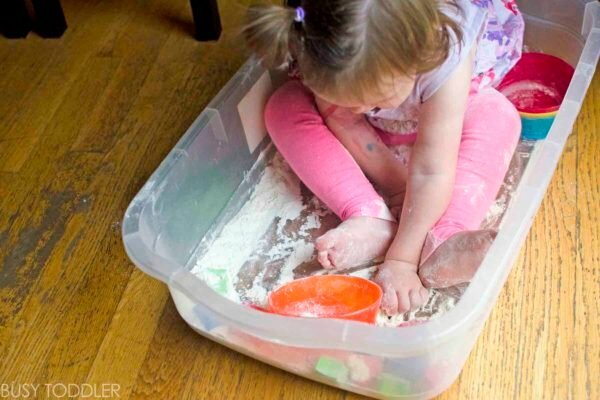 But it can be done and you can end up with one amazing taby sensory bin to play with. 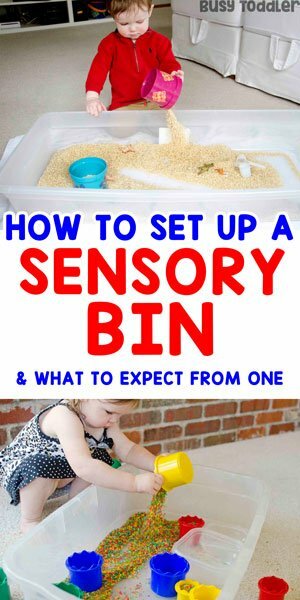 When will you make your first sensory bin for your taby?